Local handicrafts and specialties are helping build a climate-resistant future for Madagascar’s coastal communities. In days past, family life in Madagascar’s Vatovavy Fitovinany region followed the seasons. Rice seeds were always sown in October to coincide with the onset of the rainy season. But today, the seasons are unpredictable. Droughts and erratic precipitation are just some of the climate-related challenges Vivienne and her community face today. Madagascar also ranks third on the World Bank’s list of countries most vulnerable to increased frequency and intensity of storms as a result of global warming—with the island’s large coastal population particularly at risk. Over the last 20 years, extreme weather events such as flooding, cyclones and high temperatures have taken a heavy toll on the nation’s rural communities, severely affecting agriculture, livelihoods and access to basic necessities. On top of these challenges, flooding also causes saline intrusion into water sources, affecting both drinking water and agricultural productivity—a serious challenge in a country affected by seasonal food insecurity, particularly during the ‘hunger season’, the period between one harvest and the next. Alternating periods of drought and flooding have made the typical staple crop, rice, an unreliable food and livelihood source: “In a bad year, the rice is only enough to eat for one month,” Vivienne says. Today though, Vivienne has found a more reliable crop to cultivate. As the conversation turns to her handmade hat, she wears a proud smile. 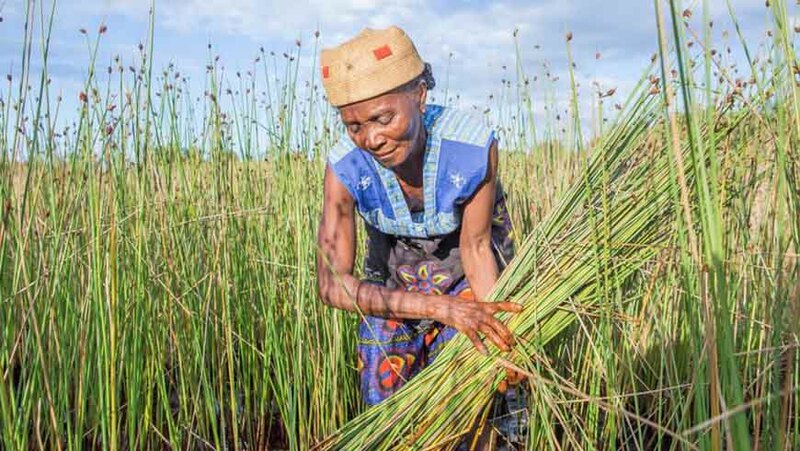 The woven hat, made from a reed known locally as ‘rambo’, represents a turning point in the fortunes of her family: she crafted it herself from her own rambo plantation. Rambo—or Grey Sedge (Lepironia articulata) —is a drought-resistant aquatic plant. Although it isn’t edible, it is more resilient than rice and its popularity as a handicraft material in Madagascar makes it a valuable crop. With poor rice harvests in recent years having jeopardized local food stocks and income, rambo is fast becoming a popular alternative crop that can be grown year-round. Weaving is not a new skill for Vivienne but cultivating the raw material is. Learning how to grow rambo has allowed her to expand her handicraft output and turn it into a viable livelihood. “I used to buy one bundle of rambo for 6,000 Ariary (US$1.72). Now we harvest about 8 – 15 bundles a month ourselves. From this, I can make and sell about ten big mats, ten small mats and six hats,” she says with satisfaction. Colourful, intricately woven baskets, mats and hats are a common sight in marketplaces and homes around Madagascar. Weavers would traditionally forage for rambo in the wild, but growing demand has opened the way for Vivienne and others to farm and sell the reed. Vivienne is one of 300 community members who were provided with rambo seeds and training in how to cultivate, care for and maximize yield from the crop under the Adapting Coastal Zone Management to Climate Change in Madagascar project. Under the Global Environment Facility-backed initiative, UN Environment and the Government of Madagascar are working to build the long-term resilience of coastal communities, focusing on ecosystem-based adaptation interventions, such as restoration of coastal ecosystems and enhancement of climate-resilient livelihoods. By encouraging and facilitating the adoption of ‘smart’ agricultural practices among local communities, the project has helped vulnerable communities to adopt improved cultivation techniques and reduce reliance on climate-fallible income sources, including through taking up businesses from handicrafts to vanilla, coffee and honey production. Xavier Rabenandrasana is one of more than 250 people who joined beekeeping training courses held by the project team across the Menabe and Vatovavy Fitovinany regions. Xavier says an erratic climate has halved his rice crop in the recent years but learning to diagnose and treat problems in his bee colonies has made apiculture a reliable alternative form of income for him, helping to increase his honey production from each hive to as much as 50 kg a year. Additional project activities include the restoration of mangrove swamps to prevent flooding, the stabilization of shorelines through revegetation, and plans for the construction of a one-kilometre-long seawall to halt the problem of coastal erosion. At an institutional level, steps have been taken to increase awareness of the impact of climate change and integrate this into government planning. A series of training sessions were delivered to assist with mainstreaming adaptation strategies into regional development frameworks and policies, the aim being long-term mechanisms for sustainable integrated coastal management. Back in Mangatsiotra village, Vivienne is demonstrating her weaving skills. She explains how weaving rambo was previously only a source of pleasure and relaxation, but participation in the project has given her a different perspective. “It became a source for earning money,” she says. Today, Vivienne’s dream might not be far off. As the project moves into its second and final stage, there will be a firm focus on linking community cooperatives to national and international handicraft buyers in the market, bringing the philosophy of bending without breaking from the coastal villages of Madagascar to a store near you.